It’s not every day that we see jeans sent to us that breach the 5 year marker, and these LVC 1955 501‘s have gone above and beyond. 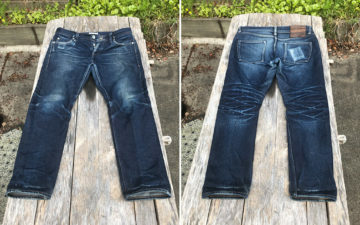 With a whopping 7 years of total wear, including two consecutive years of daily wear and only 5 washes the entire time, these guys have thrashed and burned their way into fade glory. They belong to Josh from Indiana who purchased them back in 2008 in Osaka, Japan and were one of the last runs of made in Japan jeans by LVC. Now for the damage. The left front pocket bag has completely shredded over the years, and there’s another hole in the seam of the back pocket. One epic crotch blowout later and Josh decided it was time for a little home repair where he hand stitched it back together as best he could. It’s no surprise that the denim has lightened up a bunch in seven years of wear, but where it really shows is at the thighs, knees, and seat which are almost completely white with pronounced whiskers and crease lines. Thanks for sending them in, Josh!